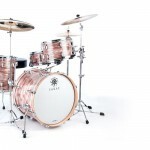 Sakae Drums is revisiting a legendary drum sound with the introduction of the Trilogy series. “Our approach was to utilize the three-ply shell in a way that would have a distinctive Sakae sound, but still pay homage to that vintage sound so loved after all these years,” states Eizo Nakata, president of Sakae Drums. The hardware is from Sakae’s PAC-D and Road Anew series. It is lightweight and helps allow the thin shell to resonate as much as possible. 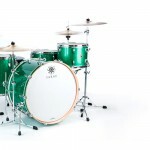 Also, the Trilogy series is extremely lightweight, making the perfect kit for the classic Jazz tones of the 50’s. Sakae’s distinctive attack, when utilized with thicker drumheads, creates the punchy, dry tones of early R&B and 70’s Rock. This entry was posted in Drum, Sakae and tagged Drum.